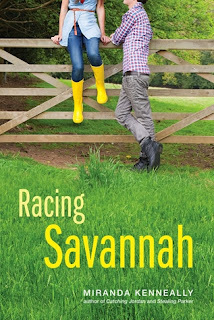 Racing Savannah by Miranda Kenneally Review ~ Love.Life.Read. Reviewed from: an ARC provided by Sourcebooks Fire—Thank You!! Ms. Kenneally's writing is simply superb. She gripes me from the first page and does not let me go until the last word has been read. Her characters development, pacing, conversation, wit and humor just have me coming back to her books time and time again. Before coming to Goodwin Farms, Savannah really seemed like she was just going through the motions of life. She knew she wanted to work with horses—that is her passion and she is good at it. She never thought of college nor rising above her situation in life. Jack and the Goodwins challenge her to consider more—why can she not go to college? Why does she have to stay in the same life as she has always known? No matter what lot in life you have been dealt in life, I think this is a powerful message that all readers can take from heart. What I enjoy so much about her books is she is not afraid to tackle sensitive topics such as socioeconomic dynamics. Her candor discussion in the acknowledgements about her own dealings with her own feelings of inadequacy as a child because she did not have the right labels as a child resonate so much with my own as well. Perhaps that is why Savannah’s story really struck a chord with me this time. To be able to get a reader to reflect and consider without demeaning or preaching is a delicate balance that Ms. Kenneally does well. Just like Savannah is addicted to candy—I am addicted to Miranda Kenneally’s books! She has solidified her spot on my favorite authors list.